Snakes are elongated, legless, carnivorous reptiles of the suborder Serpentes that can be distinguished from legless lizards by their lack of eyelids and external ears. Like all squamates, snakes are ectothermic, amniote vertebrates covered in overlapping scales. Many species of snakes have skulls with many more joints than their lizard ancestors, enabling them to swallow prey much larger than their heads with their highly mobile jaws. They are found in many sizes. Snakes have skins on their body which they shed as they grow. They are found in many colours and their scales are seen with stripes, spots or patterns. The worship of serpent deities is present in several old cultures, particularly in religion and mythology, where snakes were seen as entities of strength and renewal. Practitioners believe serpent handling dates to antiquity and quote the Gospel of Mark and the Gospel of Luke to support the practice. The serpent was more subtil than any beast of the field which the Lord God had made. And he said unto the woman, Ye shall not surely die: For God doth know that in the day ye eat thereof, then your eyes shall be opened, and ye shall be as gods, knowing good and evil. Snakehandling at the Pentecostal Church of God. Lejunior, Harlan County, Kentucky. And the woman said unto the serpent, We may eat of the fruit of the trees of the garden: But of the fruit of the tree which is in the midst of the garden, God hath said, Ye shall not eat of it, neither shall ye touch it, lest ye die. And the serpent said unto the woman, Ye shall not surely die: For God doth know that in the day ye eat thereof, then your eyes shall be opened, and ye shall be as gods, knowing good and evil. So down the great dragon was hurled, the original serpent, the one called Devil and Satan, who is misleading the entire inhabited earth; he was hurled down to the earth, and his angels were hurled down with him. "This is a footnote to our gay-marriage discussion. A woman in India last week married a snake. And it was done at a traditional Hindu ceremony attended by 2,000 people. Now, I would like to ask the proponents of gay marriage, which after all violates traditions going back through all of human history, to now absolutely positively guarantee that the next movement is not going to be allowing people to marry their pet horse, dog or cat. And you know what? Given the anything-goes culture we live in, I don't think they can deliver that guarantee." Henninger, D. (Commentator). (2006, June 10). Journal Editorial Report. New York: Fox News Channel. David Kimbrough studied, observed, participated with, and befriended many individuals in this unique expression of faith: the handling of snakes. This activity is understood not as a test of God's care and protection, but in fulfillment of the command of Jesus himself, that if done in his name then no harm would come to them. The exception to this is if the person is not right with God, then injury and/or death could follow. It was a test of the person's faith. Quoted in David L. Kimbrough (2002). Taking Up Serpents: Snake Handlers of Eastern Kentucky. Mercer University Press. ISBN 978-0-86554-798-8. Believing wholeheartedly that such an act was not only appropriate but commanded, churches practicing the handling of snakes and the drinking of poisons have often been labeled as cultic in nature, but, according to Kimbrough, nothing could be further from the truth. These are people who truly believe in taking the words of the New Testament seriously. Quoted in "Taking Up Serpents: Snake Handlers of Eastern Kentucky." And these signs shall follow them that believe: In my name shall they cast out devils; they shall speak with new tongues. They shall take up serpents; and if they drink any deadly thing, it shall not hurt them; they shall lay hands on the sick, and they shall recover. On Serpent handling dated to antiquity quoted in the Gospel of Mark(Template:Bibleref) Snake handling in some Pentecostal churches derives from this passage in the Bible. Behold, I give unto you power to tread on serpents and]] w:scorpions|scorpions]], and over all the power of the enemy: and nothing shall by any means hurt you. On Snake handling in the Gospel of Luke (Template:Bibleref). The book of Mark in the Bible's New Testament calls serpent handling one of the "signs" that true believers must follow. In "Custody of 'snake-bite orphans' split between grandparents". CNN. 12 February 1999. Retrieved on 2 January 2014. Snake handling is based on a passage in the Bible that says a sign of a true believer is the power to "take up serpents" without being harmed. In "Woman fatally bitten by snake in church". USA Today. 11 August 2006. Retrieved on 2 January 2014. Using the image of a snake for the ego he (Ashtavamka asks, you think you are the doer, so has the black serpent of ego bitten you? Whenever you think you must do, he says you have been bitten by the snake of ego. By not doing the doer, you drink the nectar of trust and can be happy. In Manuel Schoch (1 January 2007). Bitten by the Black Snake: The Ancient Wisdom of Ashtavakra. Sentient Publications. p. 35. ISBN 978-1-59181-060-5. Today, two serpent motifs are commonly used to symbolize the practice and profession of medicine. Internationally, the most popular symbol of medicine is the single serpententwined staff of Asklepios (Latin, Aesculapius), the ancient Greco-Roman god of medicine. In The Symbol of Modern Medicine: Why One Snake Is More Than Two. Annals of Internal Medicine. Retrieved on 3 January 2014. "But if I hadn't brought you in by now you might have died"
"And you've bitten me, but why? You know your bite is poisonous and now I'm going to die"
"You knew damn well I was a snake before you took me in"
S. L. Hamilton (1 January 2010). Snakes. ABDO. pp. 4-10. ISBN 978-1-61714-414-1. Nature has made snakes deadly and precise predators. Their speed, senses, and killing tools allow them to control the populations of small mammals, lizards, birds, fish and insects. Rattlesnakes venom stuns prey immediately and can kill small animals within 20 seconds. Black mambas are Africa’s fastest and most feared snake. Their venom causes muscle paralysis which stops a victim’s breathing. Snake venom is a toxic saliva. The moment the venom enters the body, it starts to destroy cells and begins to digest the prey before it is even dead. 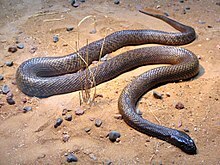 Australia’s fierce snake, also called an inland Taipan snake, has the most toxic venom of any snake. Its poison is 50 times stronger than that of an Indian cobra. Despite its name, the fierce snake is usually very calm and shy. No humans have been killed by this venomous, but easy-going reptile. A single bite by a fierce snake has enough poison to kill 100 human adults or 25,000 mice. Most sea snakes are calm and shy. Few people have ever been envenomated. Gwenetta Clark (26 November 2013). STORMY BRAIN: Inspirational Thoughts For Your Mind With Poems, Expressions, Quotes And Sayings. AuthorHouse. pp. 38–. ISBN 978-1-4918-3070-3. Snakes-low and cunning creatures that hide themselves. Yet, you don’t see them, and when you do they see you too and it is too late. Don’t go near them for your own sake. Sometimes they pretend to be harmless, but they are not. That is snake’s nature, believe it or not. If you know anyone that acts like a snake, don’t think they wont strike. “A snake will always be a snake,” slithering around to find some one to strike, not only on the ground, but anywhere else around. Watch out for two-legged snakes. Catherine Cooper Hopley (1882). Snakes: Curiosities and Wonders of Serpent Life. Griffith & Farran. pp. 526–. The numerous snakes and other animals which inhabit arid mountains, or plains destitute of water, can only quench their thirst with rain or dew. Snakes require but little water as long as they live in the open air. It is an established rule that no water is found in the maw, stomach, or entrails of snakes killed in the open air. Even when destroyed by or in piece of water. Snakes are never seen to go to drink in any part of the world. All snakes drink and die when deprived of water. Snakes drink by suction, not by lapping. And my idea is that it is the jarring or vibration through solids, and not the mere sound that affects the snakes. The ‘snake men’ of the East, whose trade is to hunt out snakes by means of sound, effect this by rapping on the wall or ceiling or by making loud clicking noises with their tongues much as by their so-called ‘music. Snakes are easily aroused by the sound of footsteps than by the sight of the approaching person. A custom is prevalent in Ceylon, we are told, of using a jingling stick in the dark to strike the ground in order to frighten snakes out of the path. May we not conclude, then, that the perception of sound to a serpent is through solids, a feeling more than a hearing of noises? The creature always prone to the ground or other solids, and with an internal aural apparatus, must be peculiarly sensitive to vibrations thus conveyed. ...the waving of hand or knee, or bright colours used by the charmers, to which the movements of the serpents respond. The snake remains rigidly still the while, the only moving thing being that investigating tongue. Any other ’spell’ or ‘fascination’ or attraction might be attributed to a soporific or paralytic rather than a pleasurable influence; and arising from noxious breath of a venomous serpent or the fixity of its eyes, never blinking. It is serpent nature to wait motionless for its prey. a scarlet tanagerin Costa Rica had been attracted out of tree down close to a snake by its quivering tongue, the only moving thing about it. Constantly affirmed by our scientific experimentalistson, snake venom that ‘as yet no antidote to them has been found'. Remedies there are in abundance and it is just as great an error to believe that all snake venom is curable. Snake virus is a natural secretion provided for the distinct physiological purpose of enabling the reptile to secure its prey. 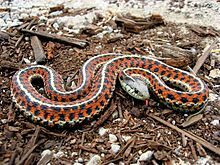 With regard to many drugs used in various countries for the cure of snake bite, it is curious to note that, as a rule, they are procured from the most deadly plants. As ‘like cures like’, so poison cures poison. Most of them are powerful stimulants, in which lies their chief virtue. Sarpa Satra, the snake sacrifice held by Janamejya in the epic Mahabharata. Sarpa Satra: Inquiry into an Unending Celebration of Hatred. Academia education. Retrieved on 2 August 2013. The myth of ‘sarpa satra’ or ‘snake sacrifice’ originally occurs in the Bhagavata Purana. The references to ‘sarpa satra’ are also there in Shivalilamrita and Dnyaneshwari. King Parikshita, the son of Abimanyu, grandson of Arjuna and father of Janamejaya who succeeded Yudhishthira on the throne of Hastinapura died of the bite of a serpent. And so, Janamejaya, the son of Parikshit is said to have performed a great sacrifice of serpents as revenge....After the intervention of Aastika the ‘sarpa satra’ ended. Frederick J. Simoons (1998). Plants of Life, Plants of Death. Univ of Wisconsin Press. pp. 82–. ISBN 978-0-299-15904-7. In Hindu India, there is a cult of snakes in which the cobra, role model for the snakes of India, is especially revered. There have been snake people (nagas or nags) and their rulers and their rulers, commonly multiheaded cobras, in Hindu mythology since antiquity. ...the worship of snakes is not limited to cultivators, but occurs among Hindus of all castes and sects, among the literate and well educated as well as the illiterate. Usha Sharma (1 January 2008). Festivals In Indian Society (2 Vols. Set). Mittal Publications. pp. 68–. ISBN 978-81-8324-113-7. Cobras reverenced throughout India and their worship takes different forms in different parts of the country. Nag Panchami celebrations may be regarded as fertility rite. There exists a wide spread belief that the same animal (cobra) has power to impart fecundity and remove barrenness. By Vogel in p. 68. In Kerala it is common to find in the houses of the high-caste Hindus a shrine for cobras in the south western corner of the large compound round the ancestral house. [So also in Coorg, every Okka has a nata which is a platform where unhewn stones representing cobra – deities are deified. The thousand headed Sheshnag or Anant is the most powerful of them and revered even by the gods. He bears the whole earth on his hood like a chaplet on his crown. When he nods or yawns, the earth, with its oceans and mountains, begin to tremble. In "Fasts & Festivals Of India". The snake deities are also regarded as the guardians of treasures on land and sea. "Nag Panchami: A mix of faith and superstition". 11 August 2013. Retrieved on 3 January 2014. The scriptures treat snakes as a community as there is a mention of nag lok. "Being residents of patallok they are considered to be part of 'srishti' and have been worshipped by Hindus for protection of their kul (family). But most significantly worship of snakes gets prominence in modern astrology because they are considered as rahu and ketu. The head of a snake is rahu and the tail ketu. If all other planets are caught between the head and the tail in a horoscope then it is termed as kaal sarp yog.